Back in the early 60s, I surfed in the U.S Open of Surfing (back then, it was called the Huntington Beach Championships). During one particularly memorable year of the competition, we all got slimed by an big oil slick. We had so much black on our jerseys that the judges couldn't see who was who, making it impossible to judge. Slipping off of our boards while crowds on the beach laughed seemed funny at the time, but looking back on the rashes, skin irritations, and chemical burns, along with the environmental damage makes the memory decidedly not funny. Back then, we were all pretty clueless about the consequences of fossil fuel pollution. These days, an oil spill means closing the beach, dead animals washing up, and workers in hazmat suits mopping up the destructive mess. We’re lucky to have only had about 4 additional large oil spills since the 1969 Santa Barbara spill that spread over 35 miles, and killed thousands of birds, animals, and fish. The thing is that fossil fuels (and thereby, plastics) have had a meaningful and positive impact on our society and our planet. They’ve played an important part of our growth, allowing us to develop better technologies and improve quality of life for millions of people. But that impact hasn’t been without its downsides, and the negative impacts that we didn’t foresee are becoming all too clear now. Everything evolves, and change is a necessary part of that progressive evolution. We once used coal to heat our homes. But then we innovated cheaper, cleaner technology, and as we did so, we reduced air pollution, improving the lives of millions. Now, solar energy workers already out number coal miners. Gasoline powered cars ruined the buggy whip business through innovation. Humans make things, improve them, make them anew, improve them again, and round and round. This is what we’ve have always done, and what we will to continue to do. For thirty years, the great minds of our country have warned us about the consequences of changing our climate through our energy consumption. They said we would have more droughts, more fires, more extreme weather. And they said we’d see it in our lifetime. Turns out they were right. As we face more environmental tragedies, regular folks are finally recognizing the consequences of fossil fuel pollution. Most polls show that the vast majority of Americans are quite concerned about the way we are wrecking our climate. Unfortunately, there are still a few politicians who receive tanker-loads of money from the oil companies who are making a huge profit off the destruction of our planet and our future. I get it–money can be persuasive. But, when I see a self-professed surfer, an ocean-lover, willing to sell out his coastal district for oil-money, that really strikes a nerve. 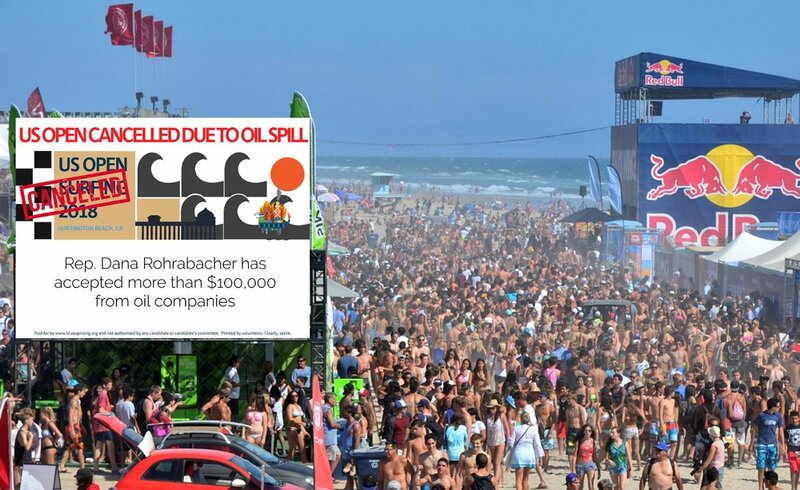 Huntington Beach Republican Congressman Dana Rohrabacher is apparently that kind of surfer. But we’re not about to be fooled by guy who keeps his boards on the wall for decoration, needs surf gloves to get into a wave, and in 2018 is still voting for oil tankers off the Southern California coast. Sorry dude, we don’t want your crude.